Acute mountain sickness and high-altitude cerebral edema refer to the cerebral abnormalities. Because millions of visitors travel to high-altitude locations each year, acute mountain sickness is a public health problem and has economic consequences, especially for the ski industry. High- altitude pulmonary edema and high-altitude cerebral edema, though uncommon, are potentially fatal. High-altitude illness also provides a useful model for studying the pathophysiological process of hypoxia in an otherwise healthy population. Epidemiology : Acute Mountain Sickness (AMS) is a well-described syndrome that affects 60% of unacclimated individuals ascending to altitudes above 8000ft with the prevalence increasing to 75% of individuals ascending to 12,000ft. Acute mountain sickness is a syndrome of nonspecific symptoms and is therefore subjective. The Lake Louise Consensus Group defined acute mountain sickness as the presence of headache in an unacclimatized person who has recently arrived at an altitude above 2500 m plus the presence of one or more of the following: gastrointestinal symptoms (anorexia, nausea, or vomiting), insomnia, dizziness, and lassitude or fatigue. - Acute High-Altitude Illnesses, 2013. And also: shortness of breath upon exertion, pins and needles, Nosebleed, Persistent rapid pulse , Drowsiness , Excessive flatulation, General malaise, Peripheral edema (swelling of hands, feet, and face) , Symptoms similar to bronchitis , Persistent dry cough , Fever , Shortness of breath even when resting, respiratory alkalosis, Cerebral edema (swelling of the brain - Headache that does not respond to analgesics, Unsteady gait, Gradual loss of consciousness, Increased nausea, Retinal haemorrhage); Transient ischemic attack or stroke, acute psychosis, intoxication (from carbon monoxide or drugs); Blue colour to the skin (cyanosis), Chest tightness or congestion, Confusion, Cough, Coughing up blood Decreased consciousness or withdrawal from social interaction, Gray or pale complexion, Cannot walk in a straight line, or walk at all; High-altitude cerebral edema (Clinically and pathophysiologically), is the end-stage of acute mountain sickness. Where Vgas is the diffusion rate, A is the area of the lung, T is the thickness of the lung membranes, P 1 and P 2 are the differences in partial pressure of any gas-but most importantly CO 2 and O 2-where in high altitudes the partial pressure differences for O 2 are low and the differences in partial pressures for CO 2 are high. Thus CO 2 will have a high diffusion out and O 2 will have a low diffusion though the alveolar membranes and into the blood. Normally, the [H+] of arterial plasma of humans at rest is maintained by the lungs and kidneys within the range of 40 ± 5 nM, corresponding to a pH of 7.36-7.44. The [H+] of the arterial plasma is also maintained during strenuous conditions and diseases: 16-160 nM or pH 6.8-7.8 . Proton concentrations in nM differ by a factor 10-6 from the normal standard-[Na+], which is around 140 mM. A pH of 6.8-6.9 is not sustainable for long, and the patient is dying in a state of coma. In contrast, a healthy athlete can survive a pH of 6.85 following supramaximal exercise with headache as the only consequence. A pH approaching 7.8 implies dissociation of all buffer proteins in order to produce H+, and negative albumin charges capture Ca 2 , so the extracellular Ca 2 falls and the patient dies in tetanic cramps including laryngeal spasms . Tetanic cramps are spontaneous prolonged or continuous muscular contractions. Buffer capacity and the bicarbonate buffer. The acid-base buffer capacity of a system is defined as the amount (mmol) of strong acid or base added to one litre (l) of the system (ie, mmol per l or mM) in order to change the pH one unit. The importance of the CO2/bicarbonate buffer is easily realised when comparing the addition of one mmol of strong acid to one litre of a closed and an open system with 24 mM bicarbonate each (pH 7.4; PCO2 5.3 kPa). The CO2/bicarbonate buffer working in a closed and an open system. In the closed system, the base concentration is reduced by 1 mM to 23, and the acid concentration is increased by one mM, because the reaction is shifted towards formation of CO2 causing a highPCO2. Accordingly, the acid concentration is now: ([0.225 X 5.3] + 1) = 0.225 X newPCO2. Thus the newPCO2 is 2.19/0.225 or 9.73 kPa. The pH of the closed system is changed to 7.02. The buffer capacity is 1/(7.4 - 7.02) = 2.6 mM per pH unit, which is negligible. In an open system such as the body, the ventilation simply eliminates excess carbon dioxide and thePCO2 is kept constant: 5.3 kPa or 40 mmHg. The chemoreceptors are bathed in extracellular fluid. Any rise in the PCO2 of the extracellular fluid is sensed by the chemoreceptors and releases a proportionate rise in ventilation. Thus, the new pH is 7.38. The buffer capacity is at least: 1/(7.4 - 7.38) = 50 mM per pH unit, which is an essential capacity. The most important buffer system for the regulation of [H+] in extended ECV is the carbonic acid (CO2)/bicarbonate system (82%), although its pK is 6.1 and not so close to ideal as for the primary/secondary phosphate system. The CO2/bicarbonate buffer is distributed in the extended ECV (up to 15 l of CO2 is bound as bicarbonate). Its buffer capacity is high, since PaCO2 is rapidly maintained normal by respiration, and the kidneys control bicarbonate excretion. Principal buffer concentrations and their contribution to the buffer capacity of the extended ECV in a healthy person. Of the non-carbonic buffer bases (18%), the haemoglobin has the dominating buffer value with 9 mM per pH unit in the extended ECV, leaving only about 2 mM per pH unit for proteins (essentially albumin) and phosphate. where k stands for three constants (6.1 + log [constant bicarbonate] - log 0.03). Thus, y is a linear function of x, and the slope of the line is -1. This slope is called an iso-bicarbonate line, and the slope reflects the buffer capacity (rise in carbonic acid per pH unit) of the bicarbonate buffer in water. Siggaard-Andersen has developed a double logarithmic plot, where factor 10 has the same distance (decade equidistant). The pH is chosen as the abscissa (pH = 6.8 - 7.8) and log PaCO2 is the ordinate (10-100 mmHg in Fig.17-3). Acetazolamide prevents AMS when taken before ascent and can speed recovery if taken after symptoms have developed. The drug works by acidifying the blood, which causes an increase in respiration and thus aids acclimatization. An effective adult dose that minimizes the common side effects of increased urination and paresthesias of the fingers and toes is 125 mg every 12 hours, beginning the day before ascent and continuing the first 2 days at altitude, or longer if ascent continues. Allergic reactions to acetazolamide are uncommon. 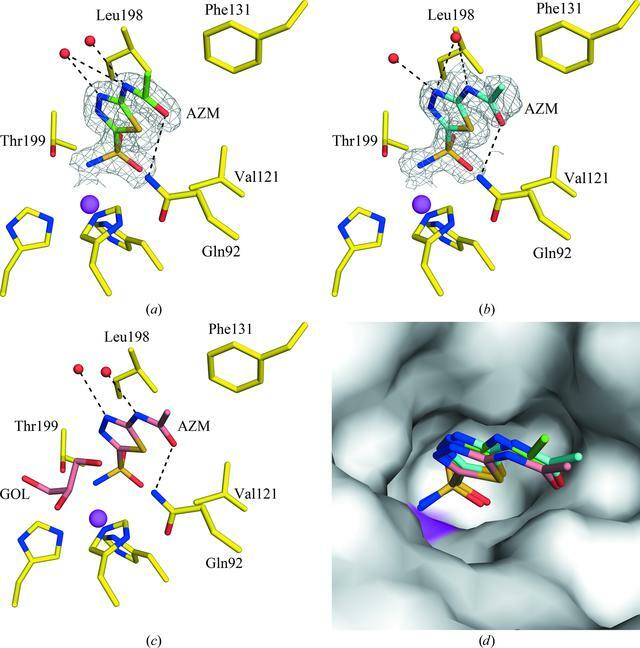 As a nonantimicrobial sulfonamide, it does not cross-react with antimicrobial sulfonamides. However, it is best avoided by people with history of anaphylaxis to any sulfa. People with history of severe penicillin allergy have occasionally had allergic reactions to acetazolamide. The pediatric dose is 5 mg/kg/day in divided doses, up to 125 mg twice a day. Acetazolamide (ACZ) inhibits the carbonic anhydrase (CA) present in the tubular lumen preventing the conversion of H2CO3 to CO2 and H2O. H2CO3 dissociates to H+ and HCO3−. Bicarbonate is lost in the tubular lumen producing a metabolic acidosis. Within the proximal tubular cell itself ACZ blocks CA preventing the conversion of CO2 and H2O to H+ and HCO3−. The reduction in protons reduces the re-absorption of sodium ions which are excreted in the urine. Active site of CA II in complex with AZM at (a) RT (298 K), (b) cryo-temperature (100 K) with sucrose and © cryo-temperature (100 K) with GOL (PDB entry 3hs4 ; Sippel et al., 2009BB30). (d) Surface representation of the three structures superposed. Residues are as labeled. The |2Fo - Fc| electron density is contoured at 1.0[sigma]. Water molecules are shown as red spheres. Hydrogen bonds are shown as black dotted lines. The active-site Zn2+ ion is shown as a magenta sphere. - Prevention of acute mountain sickness by acetazolamide in Nepali porters: a double-blind controlled trial, 2006. - Prospective, double-blind, randomized, placebo-controlled comparison of acetazolamide versus ibuprofen for prophylaxis against high altitude headache: the Headache Evaluation at Altitude Trial (HEAT), 2010. Even though the efficacy of acetazolamide for the prevention of acute mountain sickness is more limited when the baseline risk is low, Low and colleagues’ study provides clinicians with evidence to support the use of a lower dose of acetazolamide in prevention. This is important because higher doses of acetazolamide may increase the risk of drug side effects. Various drug interactions have been described, but the most common ones are with high dose aspirin, cardiac glycosides, antihypertensive drugs, and lithium. The drug should be avoided in pregnancy, particularly during the first trimester, and should not be prescribed in the presence of hepatic or renal impairment. Recognised dose dependent side effects of acetazolamide include paraesthesia, diuresis, and altered taste, and less commonly, headache and nausea. A recent meta-analysis assessed efficacy, harm, and dose responsiveness. The study found that the faster the ascent rate (14 m/h (when climbing) v 133 m/h (mechanised transport) v 4438 m/h (hypobaric chambers)), the greater the risk of acute mountain sickness, but also the greater the efficacy of acetazolamide. The risk of paraesthesia was the same for all doses, whereas the risk of polyuria and taste disturbance increased with 500 mg and 750 mg daily. Caution is needed in people with a known cross sensitivity to sulfonamides, and acetazolamide is contraindicated in those with a history of anaphylaxis with sulfonamides. In conclusion, the risk of acute mountain sickness depends on the ascent rate, the absolute altitude attained, and the individual’s susceptibility. No single preventive strategy will work in every situation, so a personalised approach, which takes into account the cumulative risk factors, is recommended. People who have not had serious problems on previous ascent to moderate altitude (~2800 m) should ascend gradually. In higher risk people or more rapid ascent to higher altitudes (>2800 m) prophylactic acetazolamide should be considered. Importantly, doses as low as 250 mg a day can be effective when ascending to a height of above 3000 m. The exact dose prescribed should take into account individual risk and the acceptability of side effects. Questions remain about the exact causes of acute mountain sickness, the mechanisms by which acetazolamide reduces symptoms, and whether even lower doses (125 mg daily) might be effective. - Effect of acetazolamide on ventilatory response in subjects with chronic mountain sickness, 2008. - Pharmacologic prophylaxis for acute mountain sickness: a systematic shortcut review, 2011. •	Reactive oxygen species (ROS) formed during acute high altitude exposure contribute to cerebral vascular leak and development of acute mountain sickness (AMS). Nuclear factor (erythroid-derived 2)-related factor 2 (Nrf2) is a transcription factor that regulates expression of greater than 90% of antioxidant genes (responsible for regulating the gene expression of phase II detoxification enzymes and antioxidant proteins through an enhancer sequence known as the antioxidant-responsive element(ARE) - a promoter element common to nearly all of the antioxidant enzymes, including peroxiredoxins, thioredoxins, catalase, glutathione peroxidase, and heme oxygenase-1 . Prophylactic activation of the antioxidant genome with Nrf2 activators would attenuate high-altitude-induced ROS formation and cerebral vascular leak furthermore, many of the drugs currently used to treat AMS symptoms have an additional trait of Nrf2 activation. Drugs that showed the ability to activate Nrf2 (Protandim, methazolamide, nifedipine, amlodipine, ambrisentan, and sitaxentan) decreased high-altitude-induced cerebral vascular leak in vivo. In vitro, Nrf2 activation in BMECs before 24 h hypoxia exposure attenuated hypoxic-induced hydrogen peroxide production and permeability. Prophylactic Nrf2 activation is effective at reducing brain vascular leak from acute high altitude exposures. Nifedipine, in addition to its known vasodilatory activities in the lung and protection against high altitude pulmonary edema, may provide protection against brain vascular leak as well. - Nrf2 activation: a potential strategy for the prevention of acute mountain sickness, 2013. - Oxidative stress in health and disease: the therapeutic potential of Nrf2 activation, 2011. Metabolic Pathway: Methazolamide is topical carbonic anhydrase inhibitor, that has a weak and transient diuretic effect, therefore use results in an increase in urinary volume, with excretion of sodium, potassium and chloride. Metabolic Pathway: Nifedipine has been formulated as both a long- and short-acting 1,4-dihydropyridine calcium channel blocker. It acts primarily on vascular smooth muscle cells by stabilizing voltage-gated L-type calcium channels in their inactive conformation. By inhibiting the influx of calcium in smooth muscle cells, nifedipine prevents calcium-dependent myocyte contraction and vasoconstriction. A second proposed mechanism for the drug’s vasodilatory effects involves pH-dependent inhibition of calcium influx via inhibition of smooth muscle carbonic anhydrase. Nifedipine is used to treat hypertension and chronic stable angina. Metabolic Pathway: Amlodipine is a long-acting 1,4-dihydropyridine calcium channel blocker. It acts primarily on vascular smooth muscle cells by stabilizing voltage-gated L-type calcium channels in their inactive conformation. By inhibiting the influx of calcium in smooth muscle cells, amlodipine prevents calcium-dependent myocyte contraction and vasoconstriction. A second proposed mechanism for the drug’s vasodilatory effects involves pH-dependent inhibition of calcium influx via inhibition of smooth muscle carbonic anhydrase. Some studies have shown that amlodipine also exerts inhibitory effects on voltage-gated N-type calcium channels. N-type calcium channels located in the central nervous system may be involved in nociceptive signaling and pain sensation. Metabolic Pathway: Sitaxentan is a competitive antagonist of endothelin-1 at the endothelin-A (ET-A) and endothelin-B (ET-B) receptors. Under normal conditions, endothelin-1 binding of ET-A or ET-B receptors causes pulmonary vasoconstriction. By blocking this interaction, Sitaxentan decreases pulmonary vascular resistance. 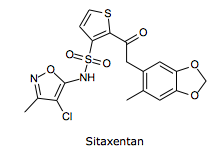 Sitaxentan has a higher affinity for ET-A than ET-B. Nutritional supplements : free radicals are neutralized by an elaborate antioxidant defense system consisting of enzymes such as catalase, superoxide dismutase, glutathione peroxidase, and numerous non-enzymatic antioxidants or ‘sacrificial’ antioxidants such as, vitamins A, E and C, glutathione, ubiquinone, and flavonoids. Based upon current information, including foods high in antioxidant nutrients or consuming moderate amounts of an antioxidant supplement containing antioxidants such as vitamin C, vitamin E, b-carotene, selenium and possibly alpha-lipoic acid during work at altitude may have benefits related to AMS, muscle soreness and oxygenation of peripheral tissues. - Work at high altitude and oxidative stress: antioxidant nutrients. Toxicology, 2002. In humans, an exogenous source of ascorbic acid is required for collagen formation and tissue repair by acting as a cofactor in the posttranslational formation of 4-hydroxyproline in Xaa-Pro-Gly sequences in collagens and other proteins. Ascorbic acid is reversibly oxidized to dehydroascorbic acid in the body. These two forms of the vitamin are believed to be important in oxidation-reduction reactions. The vitamin is involved in tyrosine metabolism, conversion of folic acid to folinic acid, carbohydrate metabolism, synthesis of lipids and proteins, iron metabolism, resistance to infections, and cellular respiration. Vitamin A (all-trans retinol) is converted in the retina to the 11-cis-isomer of retinaldehyde or 11-cis-retinal. 11-cis-retinal functions in the retina in the transduction of light into the neural signals necessary for vision. 11-cis-retinal, while attached to opsin in rhodopsin is isomerized to all-trans-retinal by light. This is the event that triggers the nerve impulse to the brain which allows for the perception of light. All-trans-retinal is then released from opsin and reduced to all-trans-retinol. All-trans-retinol is isomerized to 11-cis-retinol in the dark, and then oxidized to 11-cis-retinal. 11-cis-retinal recombines with opsin to re-form rhodopsin. Night blindness or defective vision at low illumination results from a failure to re-synthesize 11-cisretinal rapidly. Epithelial differentiation: The role of Vitamin A in epithelial differentiation, as well as in other physiological processes, involves the binding of Vitamin A to two families of nuclear retinoid receptors (retinoic acid receptors, RARs; and retinoid-X receptors, RXRs). These receptors function as ligand-activated transcription factors that modulate gene transcription. When there is not enough Vitamin A to bind these receptors, natural cell differentiation and growth are interrupted. Although all forms of Vitamin E exhibit antioxidant activity, it is known that the antioxidant activity of vitamin E is not sufficient to explain the vitamin's biological activity. Vitamin E's anti-atherogenic activity involves the inhibition of the oxidation of LDL and the accumulation of oxLDL in the arterial wall. It also appears to reduce oxLDL-induced apoptosis in human endothelial cells. Oxidation of LDL is a key early step in atherogenesis as it triggers a number of events which lead to the formation of atherosclerotic plaque. In addition, vitamin E inhibits protein kinase C (PKC) activity. PKC plays a role in smooth muscle cell proliferation, and, thus, the inhibition of PKC results in inhibition of smooth muscle cell proliferation, which is involved in atherogenesis. The neuroprotective effects of vitamin E are explained by its antioxidant effects. Many disorders of the nervous system are caused by oxidative stress. Vitamin E protects against this stress, thereby protecting the nervouse system.